, a very celebrated French protestant minister, and of the same family with Charles da Moulin, was born at Vexin Oct. 18, 1568. He imbibed the rudiments of literature at Sedan; and, when he arrived at twenty years of age, was sent to finish his education in England, where he became a member of Christ college in Cambridge. After a residence of four years in England, he went to Holland in the retinue of the duke of Wirtemberg, but was shipwrecked in his passage, and lost all his books and baggage. This occasioned his elegant poem entitled “Votiva Tabula,” which did him great credit, and procured him many friends. The French ambassador became one of his patrons (for Henry IV. 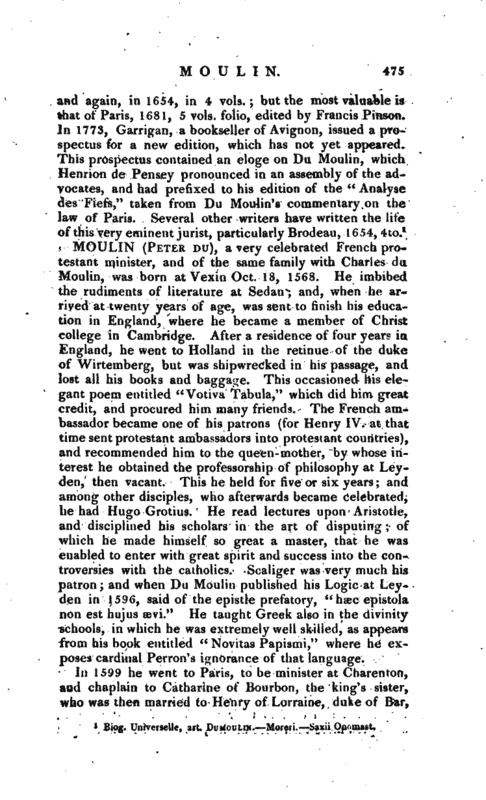 at that time sent protestant ambassadors into protestant countries), and recommended him to the queen- mother, by whose interest he obtained the professorship of philosophy at Leyden, then vacant. This he held for five or six years; and among other disciples, who afterwards became celebrated, be had Hugo Grotius. He read lectures upon Aristotle, and disciplined his scholars in the art of disputing; of which he made himself so great a master, that he was enabled to enter with great spirit and success into the controversies with the catholics. Scaliger was very much his patron; and when Du Moulin published his Logic at Ley. den in 1596, said of the epistle prefatory, “haec epistola non est hujus sevi.” He taught Greek also in the divinity schools, in which he was extremely well skilled, as appears from his book entitled “Novitas Papismi,” where he exposes cardinal Perron’s ignorance of that language. Biog, Universeile, art. Dumoulin. —Moreri. —Saxii Onomast. | and continued a determined protestant in spite of all attempts to convert her. 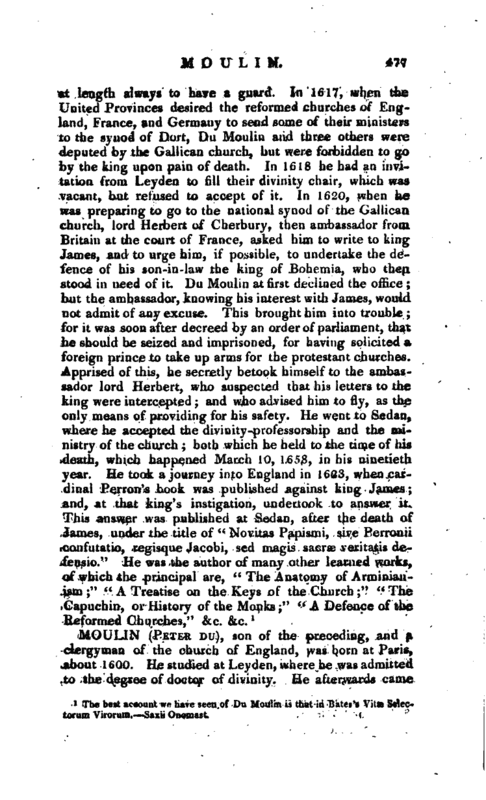 The pope applied to Henry IV. concerning the conversion of his sister, and Henry employed his divines to argue with her; but Du Moulin strengthened her sentiments against all their artifices. 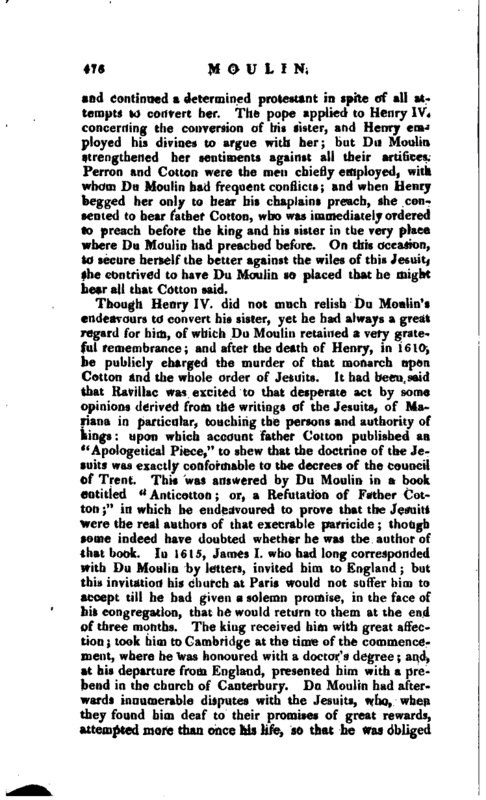 Perron and Cotton were the men chiefly employed, with whom Du Moulin had frequent conflicts; and when Henry begged her only to hear his chaplains preach, she consented to hear father Cotton, who was immediately ordered to preach before the king and his sister in the very place where Du Moulin had preached before. On this occasion, to secure herself the better against the wiles of this Jesuit, she contrived to have Du Moulin so placed that he might hear all that Cotton said. The best account we have seen of Du Moulin is that in Bates’s Vit Sleo toruin Virorum. - —Saxii Onomast.